Jeff Sundin Fishing Report August 31, 2018 "Easing In To Early Fall Fishing Patterns"
Yesterday morning, during my segment of The Morning Show on KAXE Radio, I mentioned that anglers might anticipate an uptick in Perch activity on Lake Winnie. 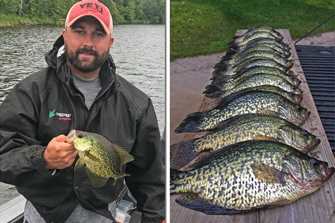 That was assuming that weather and timing would be similar to those that started the great perch run that anglers enjoyed during early fall of the 2017 fishing season. 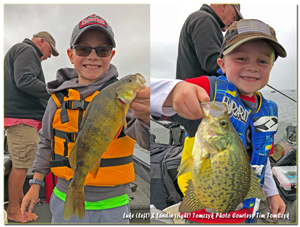 Right on cue, I received an email note from Eric Stone overnight about his groups fishing trip to Winnie during the early part of this week. “The water temperature dropped to 67 degrees early mornings Lake Winnie. (The) Perch bite was fantastic; we had to sort some to find the larger perch in the 9 to 11-1/2 inch range. Perch were caught with minnows in 15 feet of water on weed edges. Storms and water temp made walleye bite tough over the week. But we did manage some below the slot, some in the slot and a couple over the slot. For Northern Pike, it was hammer time; there were lots of fish in the 22-26 inch slot, but they were still fun when walleye bite was tough and there were some fish over the slot, up to 30 inches. On Thursday, the water conditions where we fished were a little warmer, but at 68 degrees, represented a significant cool-down from the 74 degree water I found during my most recent visit on August 17th. The last time I fished on the lake, we did well using spinners tipped with night crawlers. This time, I was apprehensive about whether the fish would still be responsive to fast moving presentations, but after the previous success, I decided to try fishing that way first. Yesterday, on a scale of 1 to 10, I'd say that the fish gave the spinner presentation an 8 in the morning, but dropped their rating to a 5 during the afternoon. There's no way to know whether the dropoff in activity was actually caused by any routine seasonal movement, or if it was the result of difficult conditions. The strong current caused by gusty winds and big waves made boat controll a challenge. Holding a steady trolling speed and keeping a consistent depth was intersting to say the least. Then there's the question about the heavy whitecaps, maybe the fish became so active that they left the areas we were fishing early in the day and moved into much shallower water for a full scale feeding run? 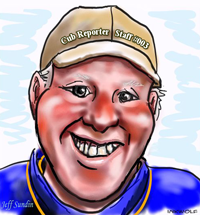 Jeff Sundin Fishing Report August 30, 2018 "Computing The Computable?" Humility comes from learning life’s lessons “the hard way” and my most recent humongous dosage of it, humility that is, came in electronic form. 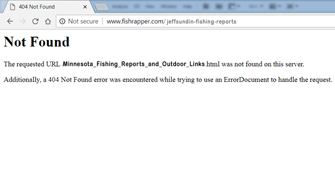 Just when I thought I was beginning to get the hang of publishing these fishing reports, I was brought to my knees when my publishing software quit working. I did all of the things that I have always done, but now instead of adding my most recent updates to the website, it was actually deleting them. That’s right, after I published the updates, I clicked on the links to be sure they looked good, but instead of looking good, they were GONE! “Stay calm, don’t panic, there’s always an easy solution to these little glitches.” Those were the words I repeated to myself over and over until after two days, the solution finally presented itself. The culprit, a glitch in the stepped-up-double-dynamic-ultra-case-sensitive-ftphtml-decoder-module had developed a mind of its own. The old ftp protocol that’s worked just fine for nearly 10 years was no longer good enough. Nope, “King Henry” decided that it was time for a change; he wanted to be uploaded in a new way, using a different protocol. Without the helping consult of Paul Bunyan Communication’s Technical Support GURU, Beau Seeger, I might have still been scratching my head today, but thankfully he helped me figure it out and it’s fixed. The bad news is that dropping everything to fix the glitch cost me a day in dry-dock, ruining what would have been a perfectly lovely day on the water. But I was out on the lake earlier this week and managed to find my way over to Leech Lake. The cold front that blew in on the heels of our recent stormy weather made its presence felt. Air temperatures were about 52 degrees when I landed the boat, forcing me to wear long pants, a sweatshirt and raingear for the first time in several weeks. Surface water temperatures on the north end of Leech Lake had fallen below 70 degrees on Tuesday, both my Humminbird and my trusty pool thermometer agreed. At the Federal Dam Landing, the temperature was 68 degrees and in the center of Portage Bay, 69 degrees. There was still a heavy algae bloom in the water and weed growth in the shallows was thick. Pike, Crappie and Perch inhabited the shallow weeds, but not in large numbers. Walleyes, if they were in the weeds, were not active enough to strike the spinners that we were trolling. Since walleye were not the primary target, no other presentations were offered and no other structures were checked out. It’s really hard to say that this was a fair test of what’s happening on Leech Lake. Some combination of the cold weather, strong storms and the full moon might have changed anything and everything that was going on there previously and I’d never know it. One thing it did tell me though was that the fast moving summer presentations will soon be giving way to more subtle approaches and in my mind, the change will be welcome. Not that I haven’t enjoyed spinning the weedlines and bouncing the breaklines, I have. But I’m ready for jigging and wiggling and drifting and fishing without flies nipping at my ankles; I’m ready for fall. "Excellent walleye fishing continues. A mix of spinners with crawlers and downrigging with crankbaits successful. When the wind is right spinners are deadly. 32-34 feet of water in Big and Little Traverse Bays holding big schools of roaming walleyes. Good colors to start with are chartreuse, pink, and gold. Fall fishing patterns will be starting soon with walleyes moving more shallow and shiners running up the Rainy River. On the Rainy River, sturgeon fishing "keep season" is open until Sept 30. Weed and river edges holding all kinds of fish. Walleyes, smallmouth bass, sturgeon, pike, crappies, and perch caught on river this past week. "There were many things going on at Border View Lodge this past week. Fishing remained strong throughout the week. There were a great number of dads and kids getting in their end of summer fishing trip, Pay it Forward was another great success, and the community had a ceremony officially welcoming the new Willie Walleye. We continue to mix drifting with spinners and crawlers with down rigging. We continue to have a great amount of slot and over Walleye with great eaters for take home or a fresh meal while you are here. Location selection has been based on weather, mixing Little Traverse and Big Traverse Bays. Cooler temps and shorter daylight hours are here. This week shows highs into the 70’s and low’s in the 40’s. Jeff Sundin Fishing Report August 27, 2018 "Catching the Catchable"
Admittedly, I’m looking forward to cooler water temperatures and the beginning of fall fishing. But this summer isn’t over yet, surface water temperatures held steady at 72 degrees on Sunday and so did the shallow water weedline fishing pattern. I know, you’ve heard it all before, Little Joe Spinners tipped with fatheads and trolled along the weedline at 1.2 to 1.3 MPH. Go ahead and laugh if you want, but while this may not be the most startling breakthrough in fishing technology, it works! Given the set of fishing conditions that we were faced with, warm water, dense weed growth and a heavy algae bloom; I’d be hard pressed to find a more suitable alternative. I’m speaking as a fishing guide of course, one who has a propensity for the mixed bag, action bite. Especially when I’m working for a dad who’s entertaining a couple of anxious young fisherme, Luke and Landin Tomczyk to the mix; then going for the action bite is a no brainer. Purists with no other goal than to single out a particular species of fish might be able to do better using a more refined presentation. On Sunday, walleyes were rarer than I expected, but luckily both crappies and perch made up the difference. During the morning, we found something to catch at every stop and it seemed like almost any weedbed would be a candidate to produce good action. Unfortunately a thunderstorm blew through the area at midday and while it wasn’t all that violent, strong winds produce heavy seas that left the lakes surface strewn with debris. I’ll never know if there were originally fish in some of the weed beds or not. But after the storm upset the pattern, I had to work a lot harder to keep the boys on fish. I had intended to spend a little time in the afternoon looking for a deep water walleye bite. But the discombobulation that I felt after the storm passed through discouraged me from re-tooling and we headed for the security of a spot that had produced well for us in the morning. That allowed us to finish the day on a high note and we returned to the dock in good spirits with a nice bag of crappie, perch and one stray walleye that struck late in the day. 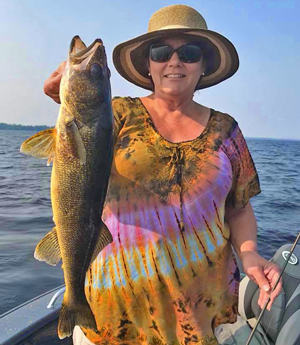 Jeff Sundin Fishing Report August 26, 2018 "Lake Winnie's Fickle Walleye"
Lake Winnibigoshish was the destination for the Minnesota Tournament Trail’s 2 day walleye tournament held on Friday and Saturday 8-24 and 8-25. For the winners, it was a great outing, but I’m guessing that most of the field regarded this weekend as a tough bite. Local Favorites Lonny and Teresa Witkofsky tied with Mike Christensen and Eric Nesius for first place; the two teams each weighing a combined, two day, 12 fish total of 23.06 pounds. After dividing the grand prize evenly, each team received $2357.50 for their efforts. Of the 62 team field, only 2 other teams, Scott Zupfer Dan Mielke along with Corey and Dayton Jahn who actually weighed in their 12 fish limit for this event. Al and Bev Standly finished 2nd, weighing in 11 fish with combined total weight of 22.24 pounds. There were a few other teams that managed 9 or 10 fish bags, but more than half, 44 of the 62 teams weighed in 6 fish or less. After Winnie’s fantastic early season start up, it’s evident that there are a lot of fish out there. But, I think the tournament results illustrate how fickle the lake is at the moment. If you land on the right fish at the right time, you will do well, but miss their feeding period by 5 minutes and you’re gonna struggle. So why did the season start out so great this year and then turn back into a tough bite? Two reasons we experienced such a strong start to the fishing season this summer was because the late ice out served to delay the onset of this year’s crop of Zebra Mussels. Then immediately after ice out, rapidly rising water temperatures served to produce better than average algae blooms. The decreased water clarity served the lake by helping to diffuse light and allowed daytime anglers better opportunities to catch more fish, more easily. The trouble today is that this year’s fresh hatch of Zebra Mussels has matured and they are doing their jobs very well. The existing population of “Zeebs” can literally filter 100% of Lake Winnie’s water in one week. That’s right, a family spending their one week vacation could conceivably watch all of the water in the entire lake be turned gin clear before returning home from their trip. Now that the lake has cleared up, it will stay that way for the rest of this season; there’s nothing that can be done about that. So if the timing this season turns out to be anything like what we experienced last year, then we should expect to hear a lot about early morning and late evening feeding patterns over the next few weeks. That was the “hot tip” coming from most anglers who consistently found and bagged walleyes in 2017. "Cutfoot Sioux has entered into its full-scale, late summer fishing period. While surface water temperatures remain warm, they are declining. The most recent readings were about 73 degrees, but we have rain, cooler temperatures and shorter days on the schedule for this week. We expect to see surface water fall below 70 degrees in the very near future. This is among the most reliable and productive times of the season for fishing weedline patterns to catch Crappie, Sunfish and Bass. Both Walleye and Northern Pike are often caught as bonus fish by anglers while they pursue the panfish. August 22, 2018 - "Is This Walleye From The Class Of 2018?" Tom, yes I do believe it is a walleye fingerling from the class of 2018. By the looks of that fingerling, I’d say that they are growing fast. I measured the length of my own fingers to extrapolate an approximate length of that fish and my estimate is somewhere between 6 and 7 inches. The growth rate will slow once the water tempers recede, but with another month of favorable growing conditions, these 2018 fingerlings should definitely be well above average size before winter. Hopefully, theories about the correlation between the late arrival of spring and a good year class of walleyes will turn out to be accurate. If the numbers really are as good as early testing suggests, then the strong year class of fish combined with what has been a good growing season should produce fingerlings large enough to survive the winter. 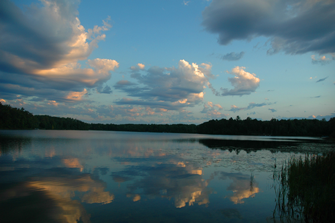 Winnie, along with several of the more popular walleye lakes in the Itasca area was definitely due for a lucky break. With a little luck, this crop of small fish will still be around next summer and keep growing fast. If they do, then anglers are only a couple of seasons away from some happy times on “Big Winnie”; maybe on some of the other big lakes too! After sharing more messages with Tom, I know that he's already seen these articles. 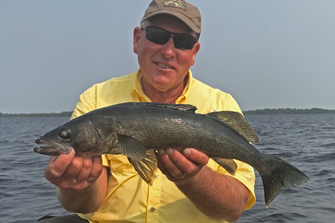 But in case you haven't seen them yet, these two links will take you to good information about both the walleye spawning season this spring and preliminary test results that suggest the possible "Super Class" of walleye for 2018 in Winnibigoshish. Review these articles "Cautiously Thrilled, 2018 Lake Winnie Population Assesment" and "Should Walleye Lovers Be Hoping For A Late Ice Out"
Good news for Lake Winnie could be made even better if there were also good hatches that might produce strong year class strength on some of the states other more popular walleye lakes and indications of a potentially great walleye year class on Winnie made me wonder if fisheries managers from other areas were seeing similar evidence. Among fisheries managers responding to my questions were Doug Schultz from the Walker, MN fisheries office and Rick Bruesewitz, Aitkin Area Fisheries Supervisor. Schultz wrote; “As a generalization, late springs (do) tend to result in pretty good walleye year classes. Stream flows tend to be up when things finally thaw out and we’re usually over the late May cold snaps, etc. Some “wild cards” to this are the presence of a preceding strong year class, it's very rare to pull off two in a row, as well as overall summer growing conditions. Warmer, longer summers also tend to benefit growth and survival through first year of life. Regarding Leech Lake so far, it’s hard to say. Seine catches were very low but we don’t rely on seining for predicting recruitment because it’s not been reliable for us. Trawl catch has been closer to long-term average(s), but Carl’s crew is out wrapping it up today, so (information is) incomplete at this point. I’ll add that growth can have a bigger influence on recruitment than abundance alone. Fewer age-0 fish that are bigger can pull off similar or stronger year classes than a high-density, slow-growing cohort because survival will be higher with the faster growing fish." 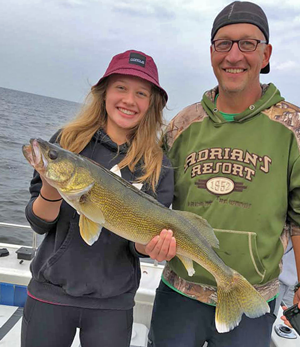 From Bruesewitz' point of view; "Considering we have done no juvenile walleye evaluations yet this year, I’d say it’s a bit too early to tell anything about the 2018 year class. We (do) consider later ice outs to typically have better odds of producing a year class, simply due to less time between spawning of eggs and (the) hatch. When eggs are spawned, they are subject to environmental conditions for a period of time, ones that are sometimes not to their benefit. Very cold weather, high winds, etc. can kill eggs directly while cold weather can delay important zooplankton blooms that are important as a food resource for walleye fry. So the bottom line is later spawns seems to have better odds. But early spawns with continual warming can work very well too. So there you go. That’s my take on things." Fisheries officials from some other areas have responded too, but have not yet begun to evaluate the 2018 year class of walleyes in their areas. Howard Fullhart, assistant area supervisor at Fergus Falls wrote; "We haven’t seen any Age-0 walleyes showing up yet. With that said, we typically don’t see them because they are too small to sample with our standard lake survey nets. We will start our Age-0 walleye assessments via night electrofishing shortly and that will give us a better indicator as to how the spring went. There are so many variables that dictate when a strong year class will occur. I think the driving factor is weather. Extended periods of cold can crash that initial zooplankton bloom. So a late spring is less likely to have those fluctuations in weather patterns. This spring we went from winter to summer and never had a cool down. Water temps almost skipped the 60’s and went right to 70’s. We saw a fair amount of sunfish that never spawned this year because of that. Within the next month we will have our night electrofishing completed and I will try and respond back as to what we saw for Age-0 walleyes." "Incredible week of fishing! The AIM MN Championship held this past Fri and Sat with two day winning bag weight over 91 lbs for 10 walleyes. Top ten teams had ten fish weights over 80 lbs each. As we have been reporting, the big fish are on fire! Most trolling crankbaits in the basin of Big Traverse Bay. Downrigging, leadcore and bouncers with cranks or trolling spinners in 32-34 feet of water has been excellent. Bright colors and large crankbaits (for big fish) are working the best right now. "Fishing deep basin, mud areas, we concentrated on the 32-34’ areas. Fish roam in huge schools and there’s many a time that you’ll be able to find a big school and have it all to yourself. That happened to Andy and me a couple years ago, while pre-fishing. On the day before the tournament, we found a bunch of nice fish, out in the middle of nowhere, and no one else was fishing there. However, on the next day, they had vanished. That’s one of the problems when dealing with big water. "The fishing remains phenomenal! We are excited for our Pay It Forward event to start tomorrow. We always look forward to greeting these special guests and hear their stories. So many good things have come from the event! 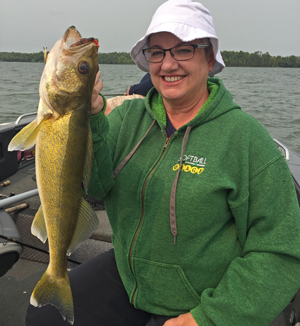 The Walleye Master Guides continue to mix a combination of drifting or trolling with crawlers and using plug on the down riggers. Great success all week, with many great eaters and shore lunches with many large Walleye released. The week ahead looks fantastic with low’s in the 50’s overnight and high’s touching the 80-degree mark. Jeff Sundin Fishing Report August 19, 2018 "Watch For Sturgeon Moon To Change the Changeable"
On July 26th, 2018 I wrote; "The surface water temperature was 76 degrees when we left the lake yesterday afternoon. That sounds warm, but it represents a decline of 6 degrees from the high temperature I recorded on that lake a couple of weeks ago. Granted, the summer isn’t over yet, we could still receive another period of hot weather. But looking at the weather forecasts, I can’t see water temperatures warming up this week; if anything temperatures are likely to decline even more." Since that time, we have received some hot weather, but the surface water temperatures on most lakes in the Itasca Area are stuck in the range somewhere between 73 and 77 degrees. While we have had lots of warm weather lately, any daytime gains in water temperature have been lost to cooler overnight temperatures. During the next couple of weeks, further declines in surface temperatures combined with shorter days will begin triggering the seasonal transition between late summer and early fall patterns. A full moon is often the catalyst for major seasonal changes and next week, routine seasonal transitions, combined with the effects of a full moon are liable to force us all to make some changes. It is not at all unusual for fishing action to intensify during this time frame. As individuals, we’re all focused on our own patterns right now and since we’ve enjoyed stabile weather, there’s been little reason to shift gears. If we happen to be fishing the right pattern in the right area, then our fishing action is liable to improve. But if we are stuck in a rut and miss the boat on shifting fishing trends, then the reverse could be true. One change that would be typical for this part of the season could be a surge in northern pike and musky activity. For me, small northern pike haven’t been hard to find, but catching ones of quality size hasn’t been easy. The full moon of August has historically been the time that larger fish show up in the weeds, rather than roaming the depths of the lakes main basins. Another possible change might be a shift away from insect based feeding patterns to minnow based patterns. For now, I see evidence that walleye and panfish continue to find and feed on insect larvae. But every day, I find more regurgitated minnows lying at the bottom of my livewell. Walleye and perch are both feeding more heavily on small fish and minnows already. As insect hatches run their course, it’s likely that trend will intensify. This will bring more fish into weedlines, rocks and shoreline points where minnows are easier to ambush. Panfish, presently holding tight in weedy cover have little reason to leave the security of the green canopy. But, weeds will begin to die off soon and the oxygen rich environment will become foul, CO2 from decaying plant matter will force some of the panfish toward deeper water. Others will relocate as they find better stands of remaining green weed growth. For a while, there will be both a deep water pattern and a shallow water one in play at the same time. If this year’s “Sturgeon Moon” is anything like last year’s, then we could begin seeing good schools of better size perch showing up on the areas larger lakes. Winnie in particular had a great early fall run of perch in 2017. If anyone has found them so far this year, they’ve kept it a secret, but I’d be keeping an eye open for that to change next week too. I’m up against the clock right now and have to run. But for today, I think that spinners, trolled over the weed tops will hold up and help entertain some youngsters who need good action. I’ll let you know how that works out tomorrow. "The walleye fishing continues to be very good for this time of year. Live bait rigs with leeches, crankbaits, and spinners are all catching fish. The key is fishing the structure. Shoreline drops and midlake humps are the better areas. Northern Pike fishing has been good. Trolling seems to be the best method to catch pike. Spoons, crankbaits, and stick baits have all been good this week. Areas adjacent to deep water are the better areas. Perch continue to be a hit or miss program. The better size perch have been quite elusive. With some effort, you can get a nice batch of perch. The problem is they are in 25' one day and the next they are in eight. A little hunting will pay off nicely. Jigs and fathead minnows are the best bait. You can troll spinners with minnows or worms to try and locate the fish. 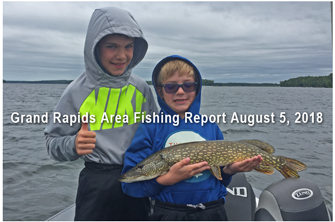 Jeff Sundin Fishing Report August 18, 2018 "Taking A Closer Look At The Middle Ground"
Surface water temperatures remain warm, ranging between 74 and 78 degrees. Panfish, bass, perch and walleye continue to respond favorably to fast moving presentations. You know that I love fishing the mixed bag pattern during this period of summer. There are times though when small fish are so hungry that it’s nearly impossible to catch one of the more desirable fish before losing your bait to a pee wee. Walleye anglers know that finding healthy stands of Cabbage Weeds will frequently lead them to a school of feeding walleye. Working the edges and open patches within them is a typical and productive pattern. But I was reminded on Friday of a not so typical, late summer pattern that can also be very productive. 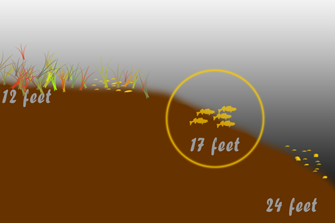 Walleyes were located along deep breaklines that were near, but not adjacent to the heaviest patches of weed growth. If I got too close to the weeds, ravenous perch would clip my night crawler off the hook before I could move 5 feet. If I fished too deep, the perch found my crawlers equally fast. But when I managed to straddle the upper edge of the deep breakline, I was able to get the spinners into a position where the walleyes could find them before the perch did. I’ve stumbled into this pattern before, usually during late summer and almost always on lakes with lower visibility. I’m not saying that you’ll never find this pattern on a clear water lake, but for me, its most closely associated with murky water, caused by a heavy algae bloom. On Friday, the sky was darkened by lingering smoke from Canadian forest fires and there was a light chop on the water. There were heavy weeds on top of the flats and they grew out toward the breakline, ending at about 12 to 13 feet deep. The relatively clean flat, lying outside the edge of the weeds extended out about 75 feet from the weedline. The steeper, main breakline ran from 16 feet down to about 24 feet, but the key depth for me was 17 feet. Like I said, if I moved deeper or shallower, all I got was nibblers. I’m guessing that the dark sky and light chop combined with several days of stable weather had encouraged the walleye to roam freely, in full scale feeding mode. I think it was the walleye’s location that forced perch to move in any direction to avoid being eaten. It didn’t matter to them if the move was toward deep water or shallow water; they just had to avoid being where they walleye were. Maybe the pattern sounds specialized, but it really isn’t; I’ve stumbled into this same pattern on some of the Itasca Area’s most popular walleye lakes. So if you’re hugging the weeds and the perch are driving you nuts, then you go deep and they’re still driving you nuts, take a closer look at the middle ground. Wired2Fish August 2018 "How to Drop Shot Bass in Transition Zones"
"Outer grass lines are prime areas to find bass during the summer peak. Water temps are maxed and baitfish shift deeper to stay in their preferred temperature ranges - bass are right there with them. Wired2Fish's McKeon Roberts thinks of these areas as major feeding highways, but there are some hazards on the road. Transitions usually have some scattered organic debris that fowl bottom baits, but a drop shot keeps you precisely in the strike window and just above the cover. McKeon shares a few tips on how he rigs and fishes a drop shot in this scenario." 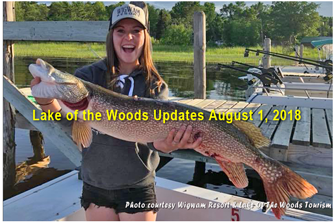 Bowen Lodge Fishing Report August 17, 2018 “Cautiously Thrilled” By Preliminary Lake Winnibigoshish Population Assessments! In our April 27, 2018 report, we wrote about the very strong year class of walleye produced in 2013 in Lake Winnibigoshish. 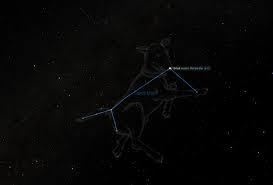 We reported that the strong 2013 year class occurred during a late spring, not unlike the one we experienced this spring. 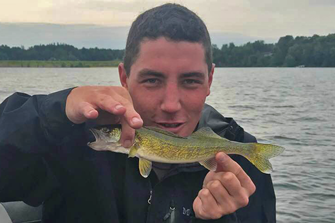 At that time we knew that through analysis of test data, the Grand Rapids area fisheries staff had come to believe that there is a likely correlation between a late spring and a strong year class of walleye. 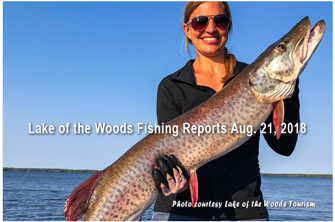 Well, a few weeks ago the 2018 DNR Fisheries assessments on Lake Winnibigoshish were conducted and the results are very promising to say the least. 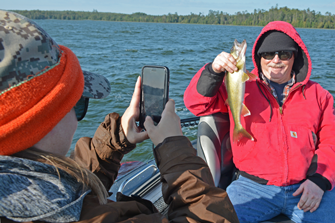 It now appears not only likely that there is a connection between a late spring and strong walleye year class, but that the 2018 year class could turn out to be one of the strongest in Lake Winnie history. 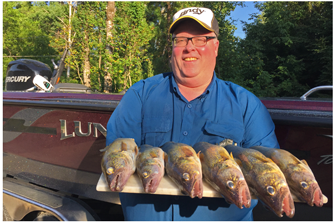 Jeff Sundin Fishing Report August 16, 2018 "Fishing the Fishable on Rainy, Pokegama and Winnie"
One look at this photo could be an instant tip off about which lake we were fishing this past weekend. The quintessential Rainy Lake black colored walleye is a familiar sight to anyone who’s fished up there. Birthday parties used to be my only excuse for taking time off the job. But this year anniversaries became another exceptionally good reason for making a holiday run up to Rainy Lake. Rainy treated us like she always has, there were plenty of larger fish to CPR, lots of smaller fish to keep us busy and unlike some years past, there were good numbers of “keeper” fish as well. In fact, getting fish for a meal was relatively easy, so we were able to enjoy a fish dinner with friends before we drove home on Monday evening. Mid-lake reefs that held fish on our last trip in early July continued to hold fish. But they were typically holding quite a bit deeper than they were last month. So for me, the tricky part of this trip was locating fish that were shallow enough to be caught and safely released. Not unlike most anglers, my instinct is to try and catch the fish that I see on my Humminbird. The best way I've found to remove the temptation of fishing too deep is to set the depth range to a fixed depth. I use 30 feet as the bottom line so if there are fish holding deeper than that, I never even see them; "out of sight, out of mind". Although there were less fish located shallow, I was able to find small groups of walleyes in 22 to 26 feet on most of the structures we fished. There were a handful of bass mixed in, but they were few and far between on the mid-lake reefs. 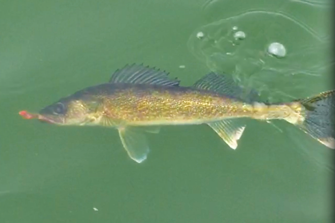 Unlike our July trip, the walleye were reluctant to pick up the wiggle worms. I think that the sunny, hot weather had them hunkering down and more reluctant to swim very far to pick up the bait. Instead, Lindy Rigs trimmed to 6 foot lengths; ¾ ounce No Snagg Sinkers and night crawlers injected with a little air was the winning presentation for us. I moved the boat slowly, never exceeding .5 MPH so we could hover above the small schools of fish long enough to entice strikes. When the fish struck, they struck aggressively and more often than not, I could catch them without feeding excessive amounts of slack line. Because we spent some of our time on the Canadian side of the lake, we didn’t experiment with alternate baits on either Saturday or Sunday. On Monday though, we met up with friends who did not have Canadian licenses. Since we fished the entire day on US waters, Joe and Jill were able to use leeches that they brought along for the day. The Lindy Rigs and leeches were definitely effective too and I would not discourage anybody from using them. One delightful surprise was that the fishing action on the US side of the lake was as good as or better than fishing the Canadian side. Yes, that’s right; we had a blast on Monday catching plenty of walleyes for a fabulous shore dinner and we all even had some extra fillets to bring home. The deep water, mid-lake bite is not the only game in town on Rainy right now. At the lodge, I talked with some folks who had been doing very well by trolling shallow running crankbaits in 7 feet of water. “I don’t know why there in that shallow water, but we’ve done our best fishing by trolling right here in Black Bay”; the angler said. I quizzed him about crappies and whether they’d picked up any and he answered that his group had caught about a dozen at random intervals throughout the week. I guess I’m temporarily out of excuses to take time away from work, so I’ll have to dream about my next trip to Rainy until next summer. But if you have some free time on your hands, I definitely think that you can find some very enjoyable fishing up there over the next few weeks. Back at home, my Tuesday fare was a longtime acquaintance, Bobby Crippa. I’d known Bobby since about 1990 when he and the KARE TV 11 news crew came up for the Rudy Perpich Governor’s Opener on Hill Lake. His lady, Ellen Christmas used Bobby’s 60th birthday as an excuse to treat him to a fishing trip, so they, along with Bobby’s son Taylor joined me for a day on Pokegama Lake in Grand Rapids. The action was good during the first half of our trip. The skies were grey, there was a chop on the water and the fish were moving. Walleyes were our primary goal and we did manage to catch some, but every other kind of fish in the lake was active too. Trolling spinners tipped with minnows produced walleye, pike, smallmouth, largemouth, rock bass, perch, sunfish, one crappie and a special birthday gift for Bobby; a gigantic Dogfish. Sometime after noon, the breeze disappeared and the sunshine returned; the trolling bite declined and I decided to try some of the deeper mid-lake structures for walleyes. Surprisingly, it was fairly easy to locate schools of fish; there are far greater numbers of them on deep structure than there were a couple of weeks ago. Unfortunately, triggering them to strike was not very easy. I’d set up one line for crawlers, one for leeches and two for large creek chubs. The minnows were the only baits that elicited strikes, and the only fish that we actually hooked were northern pike. There were at least a couple of walleye strikes, evidenced by the skinned minnows that returned to the boat after missing fish. Toward the end of our fishing day, we returned to trolling, but it was still too early for any evening bite to have started. We boated a few more pike, a couple more sunfish and some perch, but that was the end of the action. Luckily, we’d had a good morning and there were plenty of fish for our shore dinner, so we headed to the cabin and enjoyed a great meal. On Wednesday, my charter was to fish for walleye on Cutfoot and Winnie. Early in the morning, trolling the weed edges in Cutfoot produced a lot of action. There were pike, sunfish and crappies striking our spinners frequently. None of the fish were really big, but none of them were really small either. Sticking with that presentation would have made lots of sense for anyone who was looking for good action and a mixed bag. It was too bad for me that we didn’t catch any walleyes during that early portion of the trip. If we’d caught even a couple walleye by trolling, then I’d probably have stuck with the game plan longer and saved myself from a lot of needless running around the lake. Instead, I tried to beat the odds and spent several hours trying to force a walleye bite on a sunny, flat calm day when the walleye had no intention of getting excited about anything. Long story short, I headed for deep structure on both Cutfoot and on the big lake. We fished with Lindy Rigs and live bait for a while and we fished with bottom bouncers and spinners for a time as well. We did catch some fish, I think 7 or 8 altogether, but with one exception, they were all in the protected slot. With one walleye in the livewell and few signs of fish on my screen, I decided to cut my losses and head back into the weeds. It was still too early for an evening bite to start up, but we did scrounge up a few more walleyes and this time, a couple of them were “keepers”. This was one of those days where I got too caught up in the “goal” of catching walleyes. In retrospect, I think we may have been better off sticking with the weed pattern, taking our chances of catching a few more keeper walleye, but catching a greater number of mixed species. If we’d done that, it’s likely that we would have missed out on catching those larger slot fish, but we may have improved the overall weight of our larder. We may have worked harder and smarter, for less reward, but it was still a good day. Luckily, there were plenty of fish to eat, my crew was patient, kind and understanding and as a bonus, the weather was gorgeous. "Walleyes of all sizes still being caught. Trophies being caught daily. Pulling spinners and jigging a crawler working well during lower light, crankbaits effective all day in the mud. 24 -32 feet. Reefs to the west producing lots of good fish. Some struggling to find saugers but others have found them schooled up in good numbers. Chartreuse, pink, UV colors working good. On the Rainy River, sturgeon fishing "keep season" is open until Sept 30. Pike and smallies are being found in tributaries into Rainy River. Weed edges holding a variety of fish in back bays and on the river itself. Up at the NW Angle... On the Minnesota side, spinners and crawler harnesses are still the preferred method of walleye fishing, with the hot colors being pink/gold, orange/gold and orange/chartreuse. Walleye are being caught off of structure scattered in the mud between 20-30 feet. Down riggers and deep running crankbaits have also been productive. Canadian walleye are being caught in channels off of islands and along reefs in 18-25 feet of water. Both bottom bouncers with a crawler harness and a jig with minnow or shiner have both been successful. "Hot has been the trend! Hot fishing and Hot weather. The bite remains strong and we have had a great number of large Walleye caught and released again this past week. There is still a mix of bait fishing and trolling with plugs. Drifting or trolling with crawlers in the 22-23 foot range in Little Traverse Bay has been productive some mornings. While in Big Traverse, down rigging or trolling spinners in 32-34 feet of water has been steadily excellent. While having the option of using bait or using plugs on the down riggers there have been significant differences. The down riggers allow for a more controlled and consistent presentation and out catch rod holding 10-1 without the hassle of snap weights or other devices. Mixed temperatures are forecasted this week. We have daytime high’s in the 60’s on some days and 80’s on others. Overnight temps ranging in the upper 40-50’s. "This week had something for everyone. As far as fishing went, no matter what tactic you used, the fish would bite at some point in the week. Walleyes were caught trolling crankbaits, spinners, and fishing live bait rigs on the structure. There was a good number of keeper size walleyes caught. It was the best percentage versus slot fish we have seen this year. If you are trolling, key areas are flats with deep water immediatly adjacent to the flat. 14-16' was the best depths. Live bait rigs with leeches were the ticket on the structure. When it was calm, the humps were the best. When the wind blows, head to the main bars. No reports of shallow walleyes this past week. It won't be long, the fish will move shallow. Northern fishing was definitely a trolling bite. Crankbaits and spoons in the areas where the walleyes are being caught trolling. Many nice fish over the slot have been caught. Perch fishing has improved. Look in the deeper water 20-30' where there is life on the graph. There will be perch in the vicinity. Jigs and fathead minnows are the best bait. 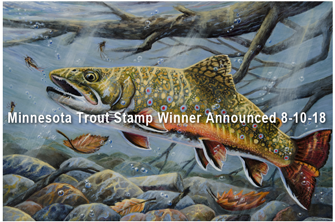 August 10, 2018 "St. Louis Park Artist Wins Trout and Salmon Stamp Contest"
St. Louis Park artist Richard Goodkind has won the Minnesota Department of Natural Resources trout and salmon stamp contest with a painting of a brook trout. The painting was selected by judges from among nine submissions for the annual contest, and will be featured on the 2019 stamp. Goodkind is now a two-time winner of the trout stamp contest, having previously won in 2010. Two entries advanced to the final stage of judging during the contest that happened Aug. 2 at the DNR Central Office in St. Paul. The runner-up in this year’s contest was Stuart Nelson of Cloquet. The DNR offers no prizes for the stamp contest winner, but the winning artist retains the right to reproduce the work. The following species will be eligible for the 2020 stamp: rainbow, brown, splake and lake trout, coho, pink, chinook and Atlantic salmon. Brook trout designs will not be eligible for the 2020 stamp. The trout and salmon stamp validation is sold for $10 along with fishing licenses and is required for Minnesota residents age 18 to 64 and non-residents older than age 18 and under age 65 to fish designated trout streams, trout lakes and Lake Superior and when in possession of trout or salmon. For an extra 75 cents, purchasers can receive the validation as well as the pictorial stamp in the mail. It also is sold as a collectible. Revenue from stamp sales is dedicated to trout and salmon management and habitat work. For more information on trout fishing license requirements, visit mndnr.gov/fishing. Wired2Fish August 10, 2018 "Avoid Kinked Fluorocarbon to Prevent Break-Offs"
"Heavy fluorocarbon has a tendency to kink when folded. You risk break-offs if that kink makes it into your knot or somewhere up the line. Kyle Peterson delivers a simple tip that can save you from losing fish by avoiding kinks in fluorocarbon." Jeff Sundin Fishing Report August 9, 2018 "Heating the Heatable Encourages Early Morning Fishing Plans"
Looking ahead at the weekend weather forecast makes me feel like going to bed really early. That’s because I and the Hippie Chick are going to steal a few days of fishing for our own fun and if we want both comfort and good fishing, we’ll have to be up at the crack of dawn. Yesterday I wrote about the benefits of fishing during the warm water, “Dog Days” of summer. I said that I am gaining more respect for this time of the season every year and I meant it. But, just because I know that the fishing is good, doesn’t mean I like fishing under the blazing sun on a calm day. By 10:30 AM on Wednesday, I had sweat dripping down my back and the flies were already getting active. The fish were biting, but hour by hour, they were hunkering deeper into the weeds and by mid-afternoon it was literally impossible to catch one without dragging up a pound of weeds along with it. I’m not sure that any of us would want to work that hard at catching a fish unless we didn’t have another choice. Since I do have a choice this weekend, I think I’ll do whatever I can to make fishing the most relaxing and fun. I’m not sure if we’ll be on the right lake to pursue panfish, but casting for crappies along the weed edges would be a really good idea for early morning. It’s not at all rare to stumble into walleyes, sunfish, bass and pike, so I’d be ready to take advantage of any un-planned opportunity. If the Hippie Chick prefers lunker hunting, I might try some pike fishing, we haven’t done that for a while and it’s getting to be “that time” of the season; so maybe we’ll try a little trolling. Open ended as my weekend plans may be, I’m not quite there yet. I will be working today and the present plan is the pursuit of pike, so whatever happens, you’ll be the first to know. If you’d like to go fishing this weekend and your schedule allows, then I’d suggest following our lead. Our plan will included arriving at the lake early, fishing the sweet part of the morning and then taking a nice dip in the water before heading home for lunch and a nap. If it’s really nice during the evening, we might sneak out again for a couple hours, but then again, maybe not; it depends. 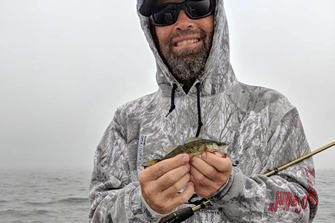 Jeff Sundin Fishing Report August 8, 2018 "HEY, Listen Up, This Is Sirius!" Warm, stable weather is always good for fishing, but it’s even better for entertaining mom on Mother’s Day. Oh I know, for most folks Mother’s Day occurs in May, but my mom doesn’t like going out in the boat when the weather is chilly. That’s why my family has shifted the date of Mother’s Day (observed) into the typically dry, warm “Dog Days” of August. Lots of anglers have heard the expression “dog days of summer”, but not many know where the term originated or how to benefit from the great walleye fishing that occurs during this period of time. Most folks don’t associate this time of the summer with great walleye fishing. But I am gaining more respect for this time of the season every year. Over the past decade, many of my most memorable fishing experiences have occurred during this period and this year is shaping up to be no exception. Of course you have to find fish before you can catch them, but assuming that you have the ability to find fish, you will almost certainly be able to catch some. The expression “finesse fishing” has no place in the vocabulary of anglers fishing during this period. Warm water raises fish metabolism and the warmer they get, the more active they become. At a certain point, some species of fish will feed almost non-stop. For anglers, the trick is to use fast moving lures that take advantage of the fish’s higher metabolic rate. Over the past week, I’ve caught fish using both Little Joe Spinners and Lindy’s hybrid lure, the Lil' Guy. Both of them have been productive and you can scroll through the reports for more details about how and where we’ve used them. Obviously, the secret is to getting fish to strike is placing the lure within the fish’s strike zone. I think that’s the one thing that I haven’t emphasized enough; how to place the lure in the strike zone. How you get your lure into the right territory depends on where the fish are located. When you think about it, the sinker you choose is critical, in fact selecting the right weight to get your offering into the strike zone is just as important as is choosing the right lure. Whether you’re using spinners or Lil' Guys, they will catch fish in deep water, shallow water and everywhere in between. What you will have to decide, based on the location of the fish you find, is what style and weight sinker to use for proper placement. It’s not easy to fish a weed patch with heavy bottom bouncers and a 3/16 ounce bullet sinker is never going to get your spinner into 25 feet of water. Conversely, that light weight bullet sinker will slither through the weeds without getting hung up and a 2 ounce bottom bouncer will easily allow you to hover over the rocks, logs and debris on the bottom. Here’s a complete list of every sinker that I’ve used this summer. If you have a few of each, you will have almost every conceivable fishing situation covered. Bullet sinkers for fishing the weeds, 1/16, 1/8 and 3/16 ounce sizes will cover water depths ranging from 4 to 12 feet. Lindy No Snagg Sinkers 1/2, 3/4 and 1 ounce sizes will cover fishing on sand flats, clam beds and sparse weed patches in water depths ranging between 8 and 16 feet. Bottom bouncers in 1, 1-1/2, 2 and 2-1/2 ounce sizes will cover the deep water situations. A good rule of thumb for bottom bouncers is to use 1 ounce of weight for every 10 feet of depth. I almost always have 1-1/2 ounce weights on my rods unless I need to fish deeper than 20 feet. A 2 ounce weight covers me down to about 26 feet and I never fish any deeper than that anyway. If you see me mention trolling, then you can rest assured that one of the listed sinkers was in use at the time. "The big walleyes are still on fire. The fields East of Long Point and North of Zippel Bay continues to be good. Pulling spinners and jigging during the morning, crankbaits effective all day. West bar of garden producing as well as Little Oak area. Trolling cranks out in the deep mud bringing in walleyes of all sizes including many trophy walleyes. 24 -32 feet. Chartreuse, pink, UV colors working good most days and purple on cloudy days. On the Rainy River, sturgeon fishing "keep season" is open until Sept 30. Pike and smallies are being found in tributaries into Rainy River. Wabanica, Baudette Bay, and Clementson always holding good fish. Weed edges holding a variety of fish. Up at the NW Angle on Minnesota side, walleyes biting while bait fishing with a jig and minnow on top of structure like reefs and rocks. Bottom bouncers and crankbaits in a little deeper water such as 24-28. "We are continuing with another week of Excellent fishing! It is the time of year when the morning boat ride is quite cool, then the afternoons are sunny and warm. They are catching fish in the deeper water. Trolling spinners and crawlers to start the day, then switching to down rigging. Good news! We are able to do shore lunches again! There is warm weather predicted for later in the week. It’s a great time to grab some friends and catch some fish. Wired2Fish August, 2018 "When Monofilament Line Outperforms Braid for Topwater Baits"
"Fishing line is a critical component to successful topwater fishing. Choose one that sinks (fluorocarbon), and you'll negatively impact the bait's performance. Monofilament and braided line are your 2 options - both float, and when tied correctly provide freedom of movement to the bait. Bass pro Drew Benton relies on both for topwater fishing, opting for braid for some baits, but switching to a strong yet supple monofilament line for others. He outlines both in this short, straightforward video." 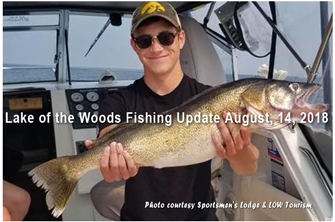 Jeff Sundin Fishing Report August 5, 2018 "Less Camp (Hastings) More Fish"
Most years, Camp Hastings makes a bigger splash on the fishing report pages. This year though, the Hasting family fishing adventure with me was all packed into a single day. When I quizzed the morning crew about what fish we should pursue, Barry, Owen and Blaine Chheatham said that they had northern pike fishing in mind. Knowing both that I’d have another crew trading places in the afternoon and that I’d be cooking a lunch for the whole family at noon, I decided that Pokegama was the best place to pack everything into one location. I reasoned that we would find plenty of action amidst the weeds and no matter what we caught, it would be entertaining for the kids, plus bagging a few of these and a few of those would help round out the noon meal. Admittedly, I had my doubts about how much action we would find; the weather forecast of sunny skies wasn’t my favorite. Luckily, the forecast was wrong, we arrived at the landing to find grey, drizzly skies and a lake stirred up by whitecaps. For frequent readers, this will be no surprise, but I still have to say that we were fishing with the old reliable Little Joe Spinners. I had the rods rigged for trolling with 3/16 ounce bullet sinkers and we tipped the hooks with small golden shiners. Using minnows instead of night crawlers would encourage more northern strikes; I thought. The surface temperature on Pokegama was 72 degrees, a decline of 2 degrees since my most recent visit. The lower surface temperature had a dampening effect on the number of bass and sunfish that struck our lures. But pike, crappie, perch and walleyes didn’t seem to mind the cooler temperatures. In fact, I’m not sure if the action for perch and pike wasn’t better now than it had been with warmer surface water. By the time we returned to the Tioga Landing to cook lunch, Barry and the boys has landed at least a dozen pike, a couple of walleyes and enough nice perch to fill the frying pan, twice. So our shore Lunch consisted of pike prepared blackened style and perch fried the old fashioned way, in Jeff’s original shore lunch recipe. The afternoon crew set out with a goal of picking up where the boys left off. But by the time we were back on the water it was after 2:30 PM and the breeze had diminished. The skies were still grey, but Pokegama was still showing signs of its famous afternoon slow-downs. We did not go pikeless, but the action was slower than what the boys experienced in the morning. That is until we stumbled into one of our lucky little discoveries. Toward the end of a rather long trolling pass, we’d picked up a few small pike and couple of baby perch. I just beginning to lose interest in the area we were fishing when WHAM, Kristin pulled in a nice crappie. Then I caught one and after that Chris popped another one into the boat. It didn’t take long to figure out that we had located a patch of cabbage weeds that was holding a lot of crappies. As long as I stayed near the cabbage, we continued to catch fish. We trolled the area for a couple of hours and caught fish regularly the whole time. They were not always crappies; pike and small bass were in the same area and added to the action as well. For anybody who’s fished Pokegama a lot, it will be no surprise that many of the crappies we caught were small ones. But I was impressed by the number of times that one of us would reel in a fish that was way above average. I don’t think we caught any fish over about 12 inches, but there were some solid 10-1/2 to 11 inch keepers in the mix. We did not bag a full 2 person limit for the crew either, but we came close, ending the day with 17 fish in the livewell. Northern Pike, when pursued for the table don’t have to be very large to be impressive. That’s good because with the new protected slot on pike, we were mandated to release at least a dozen fish that would formerly have been our “preferred” eating size fish. That said, we fed a lot of people using only 4 fish that were in the 20-21 inch size range. Being proud of small fish seems counter intuitive, but it definitely is a good way of feeding the family. "This past week we were transported back to the past, Circa 1980. When you went walleye fishing, you put on a Lindy type rig with a bare hook, checked the wind, grabbed some leeches, and headed out to the appropriate bar on the lake that the wind dictated you go. The main bars produced walleyes all week long. Sugar, Moses, Snag Hole, Horseshoe, and Bena. Names that haven't been mentioned a whole lot the past couple of years. Oh, when it was calm, the humps were still good. I think the reason the leeches were better is that you couldn't get a worm past the seven inch perch on most of the structures. Trollers have had a little success, but the live bait was far better. Northerns are biting on spoons and crankbaits. You can use jigs and small suckers as well. Perch continue to be an enigma. There are small perch everywhere, but to target the nice keeper size perch have been elusive. We didn't have anyone really seriously look last week, but I would say the north shore is your best bet. Look for cabbage weeds and the perch will be near. All of the fishermen left this morning with smiles on their faces. They said it was some of the best walleye fishing they have seen in quite some time. Wired2Fish August 1, 2018 "7 Tips to Make Big Swimbait Bass Bite"
"Some of the coolest experiences in bass fishing can be had with big swimbaits because they will expose a lot of big bass you might not otherwise see. But it would be a lie to say it’s all cool stories all the time. There can be a lot of frustration with hunting bigger bass with big swimbaits and lot of near misses that make you question what you are doing. I think everyone that has thrown big swimbaits has struggled with turning followers into biters at some point. "Drifting and trolling spinners and crawlers east of Long Point has been on fire. Reports of one pass being mainly slot fish and the next pass picking away at walleyes and saugers for the fry pan. Some anglers even jigging with good success. Trolling cranks out in the deep mud good when fishing slows in the afternoon. 24 -32 feet. As always hammered gold, chartreuse, pink, UV colors are good starting points. On the Rainy River, sturgeon fishing "keep season" is open until Sept 30. Hearing good reports. Pike and smallies are being found in tributaries into Rainy River. Weed edges holding a variety of fish. "The trend has continued with another great week of fishing! It is the time of year when the morning boat ride is quite cool, then the afternoons are sunny and warm. Down rigging has been the method of choice, more towards the end of the week, with many big fish to show for it. There is still a good bait bite going up by Little Oak also. Our Guides have spent most of the time this past week in Little Traverse Bay off of Little Oak Island although there has been time spent in the deeper 36-foot range of Big Traverse. We are still on a no shore lunch agenda; the bugs have been so bad on Garden Island. The last shore lunch we did guests were in the water using the dock as a table to try and get away from the black biting flies and horse flies. Again, we have another great week forecasted. Highs hitting 80 and lows in the 50’s coming up this week. 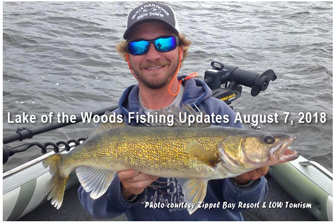 Jeff Sundin Fishing Report August 1, 2018 "Question; Wiggle Worming Walleyes, What Are The Basics?" On August 1 Loren Keizer Wrote; "Q) Hello Jeff. I was curious if you could share any information on your "wiggle worm" technique? I'm going to be fishing this weekend with my oldest son, 10, and nephew, 12. I'd like to try targeting some walleyes over shallow weed flats and thought this technique would work? Thanks in advance for any help or information." A) Loren, Wiggle Worming does work for fishing in and around weed patches. During this warm water period, you are likely to catch a lot more than just walleyes. Bass, panfish and even pike are liable to keep the kids busy while your search for walleyes takes you down the weedline. There have been a lot of calls and emails lately from readers asking for one sort of advice or another. I’m doing my best to keep up and at the same time, prioritize the list so that I get to the really pressing issues first. Since the “busy season” is in full swing, my office time is really limited. So if you’ve dropped me a line and haven’t received a reply, I apologize, I will get the stack cleared up eventually, so please bear with me. I’m usually checking messages during the wee hours of early morning, so my schedule tends to favor emails rather than phone calls. Also, I do offer The Early Bird Insider’s News List, an “opt-in” email list that I routinely use for announcing last minute openings, special announcement and fishing events. List membership is free and it only takes a few seconds to register. I can’t sign you up; you need to do this yourself by clicking the link to the news list.